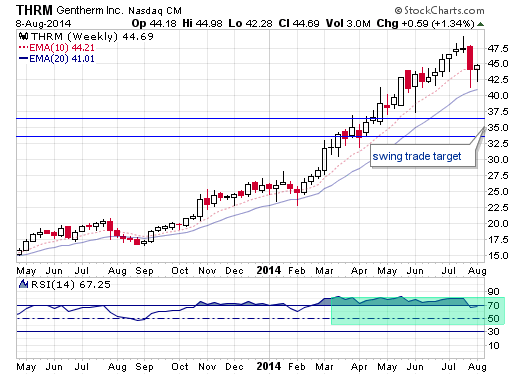 I like the strength of THRM on the weekly for a decent swing trade setup after it has a further sell off. It could just keep going up, but if I was going to take a position in this stock I’d need to see it pullback to the $33-36 range. Watch the RSI as it’s very overbought and needs to go under 50 at a minimum before I’d feel comfortable buying a starter position. Gentherm Incorporated designs, develops, and manufactures thermal management technologies and cable systems worldwide. It operates through three segments: Climate Controlled Seats (CCS), Advanced Technology, and W.E.T.